The Silver Birch Press Silver Anthology (Fall, 2012) was dedicated to legendary poet Jack Micheline (birth name: Harold Martin Silver). Silver Anthology co-editor Joan Jobe Smith — a celebrated, prolific poet in her own right — considers Micheline her favorite poet. The Silver Anthology — available at Amazon.com — includes Joan’s recollections of her conversations with Micheline along with some of her rare photos taken during Micheline’s final years (he passed away in 1998 at age 69). The anthology also includes an essay about Micheline from Fred Voss and a poetic paean to him from Linda King. Micheline was a poet’s poet — and with the recent release of JACK MICHELINE IN AMSTERDAM by Unrequited Records, today’s poetry aficionados can understand why. 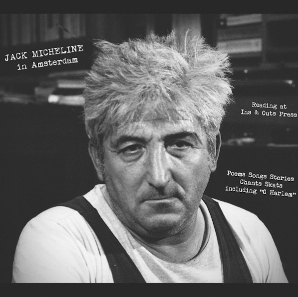 I recently listened to JACK MICHELINE IN AMSTERDAM, a CD of Micheline’s 1982 performance of poems, songs, stories, chants & skats at Ins & Outs Press, and was captivated by Micheline’s material, his charm, his joie de vivre. The recording made me feel as if I were right there, thirty years ago, witness to Micheline’s genius. Kudos to Tate Swindell of Unrequited Records and Eddie Woods, who organized the 1982 reading and wrote liner notes for the 2012 release, for this remarkable recording. In 1978, Eddie Woods (a renowned multi-hyphenate: journalist-poet-prose writer-editor-publisher) established Ins & Outs Press with Jane Harvey — and for a number of years published Ins & Outs, a literary magazine that featured a host of legendary writers, including Allen Ginsberg, Gregory Corso, Paul Bowles, and Lawrence Ferlinghetti. In the upcoming Silver Birch Press Green Anthology (available March 15, 2013), we are honored to feature work by Eddie Woods — including a condensed version of his 1982 interview with Jack Micheline. The volume will also feature poetry from Woods and Micheline. To purchase a CD of JACK MICHELINE IN AMSTERDAM — and I urge you to do so to support this worthy venture and keep Micheline’s spirit alive — please visit the Unrequited Records website.